Emilio Picariello is a character who captures the imagination. An entrepreneur to the core, he immigrated to New York from Italy as a young man of 20, and four years later, he had two small stores—one in Toronto and one in Montreal. 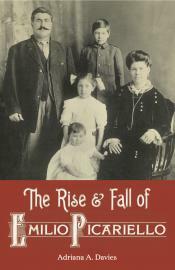 Like many others, however, Picariello heard the call to head west and landed in Fernie with his young family in 1911. It was in Fernie where Picariello really came into his own as a businessman and became very successful. His stable of businesses included pasta, confectionery stores, cigar-making, ice cream-making and bottle collection. The rising tide of Prohibition, meant that bootlegging was a natural progression of “Emperor Pick’s” acumen. Bootlegging put him on the wrong side of the law, however. After a failed sting operation set up by the Alberta Provincial Police, Picariello had a heated argument with Constable Stephen Lawson. Shots were fired and Lawson lost his life. Picariello and Florence Lassandro were found guilty and both were hanged in Fort Saskatchewan in 1923. Historian Adriana Davies approaches Picariello’s story as a cold case. While there is little doubt he was a bootlegger, she calls into question the circumstances that lead to Constable Lawson’s death and if Picariello was ultimately responsible. Through meticulous research of family histories, legal documents, personal letters and other archival material, she is able to fairly ask important questions: Did his Italian heritage motivate the APP's sting operation? Was his trial defense adequate? Was there another shooter? Were Picariello and Lassandro wrongfully convicted?